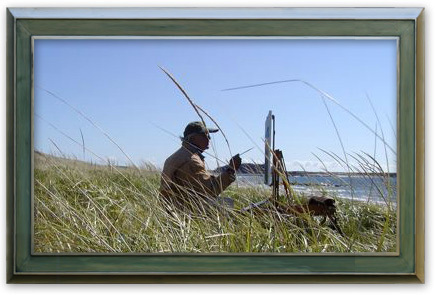 I began painting in Maine in the mid 70's. With a group of artist friends, I came for summers of painting the Maine landscape. The trips would focus on Maine's rocky coast and its many islands. I relocated to Maine in 1984 with my wife Susan and our two daughters Jeannette and Julia. I have shown my work in galleries in New York, California, Florida, North Carolina, and Maine. I was the subject of a feature article in the May, 1995 issue of American Artist Magazine. Currently, I am working on paintings done in and around Cape Elizabeth. I am a contemporary realist painter and draw my inspiration from those places and things close to me. I teach and paint out of my studio in Portland, Maine. I am represented in The Portland Museum Art (The Elizabeth Noyce Collection) and in many private and corporate collections throughout the U.S. and abroad. For further information or inquires, contact me at my studio in Portland, 207-838-1393, or e-mail me: mark@markhaltof.com.